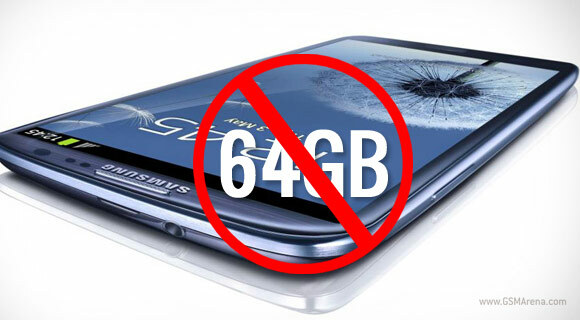 Samsung cancels the 64GB I9300 Galaxy S III? When the Galaxy S III was announced a couple of months ago, it was said to come in 16GB, 32GB and 64GB varieties. The latter model, however, seems to be axed by Samsung as UK retailer Expansys has cancelled its pre-orders. A reader of ours contacted us, saying that his order couldn't be processed as Samsung "has decided not to release the unit". However, the 16GB model remains available in pebble blue and white. Looks like Samsung has decided that the 64GB model of the S III hasn't generated enough user interest and manufacturing it won't be worth it. That's not surprising, considering the device's microSD card slot, which allows for far cheaper memory expansion. Naturally, this could turn out to be a simple misunderstanding between Samsung and the retailer and the 64GB version might actually make it to the shelves, but chances are looking slim for now. Thanks for the tip, Nick O'Sullivan!